(CNN) -- Two people were found dead and a third person is still believed missing in a North Carolina food plant heavily damaged in a morning explosion, police said Tuesday night. Part of a collapsed ConAgra Foods plant lies atop parked cars Tuesday in Garner, North Carolina. Four people were in critical condition after the explosion at the ConAgra Foods plant in the town of Garner, CNN affiliate WRAL-TV reported. 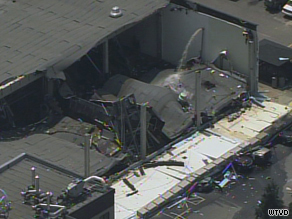 The explosion, reported about 11:30 a.m. Tuesday, caused sections of the roof to collapse. Search efforts for those missing were slowed by ammonia leaks and a fire that was not extinguished until afternoon. "There was no warnings, no signs," Garner Mayor Ronnie Williams said. "It all happened very abruptly." At least 38 people were transported to area hospitals, said Jeff Hammerstein, district chief for Wake County Emergency Medical Services. Four burn victims -- two males and two females -- were undergoing critical care at the North Carolina Jaycee Burn Center, said Dr. Bruce Cairns. The patients suffered burns that covered from 40 to 60 percent of their bodies, Cairns said. Police said recovery workers still were trying to get the two bodies out of the plant, which makes Slim Jim food products. The victims' names weren't immediately available. More than 300 people were in the plant when the explosion happened, authorities said. The cause of the blast was unknown, according to Garner police spokesman Joe Binns. Rescuers were crawling into the rubble -- sometimes in pockets of space less than 30 inches tall -- in attempts to access the two bodies and find the missing person, officials said at a news conference Tuesday night. The search crews were moving slowly in part because the building is very unstable, officials said. ConAgra Foods' brands include Healthy Choice, Chef Boyardee and Orville Redenbacher, among others. The Garner plant is known for producing Slim Jim beef jerky products. The company was "working with authorities on the ground to ensure that their employees are getting all of the support that they need," said Stephanie Childs, ConAgra director of corporate communication. "The employees' health is their only real concern at this time." Gail Ruffin, a ConAgra worker who was in the plant when the explosion happened, told WRAL she heard a boom. "The ceiling start coming down, and we all start running," Ruffin, who wasn't injured, told WRAL. "Everyone was trying to get to the exit door. ... I was just trying to get out, and then we just [saw] people that [were] burned -- blood all over them." Garner is seven miles south of Raleigh.